Since the rise of the smartphone, native apps have been a core component and have taken the world by storm. As Korf and Oksman state, ‘Native apps look and perform the best’ . Consumers clearly agree; in 2015 alone there were 75 billion apps downloaded across Android and iOS . These numbers have been generated across Google Play which currently has 2,140,655 apps and iTunes AppStore with a further 1,400,000+ apps . These numbers are only set to increase considering the growth in cheap smartphones entering the market will enable market access to an entire generation who are on the bottom end of the social mobility ladder. The market is growing and the technological framework is increasing to meet its demands. But can mobile web provide an alternative to this dominate format? Unlike HTML5 and Hybrid applications which use web elements inside app frameworks, progressive web applications are websites which through code can become applications. The website is built with commands that the browser can recognise which will enable it to perform functions which users have come to know and love about apps. These rules are outlined in the extensible web manifesto built in partnership between Mozilla, Opera, and Google Chrome among others. Provided PWAs follow these principals, will they be able to compete with their native cousins? In fact, if they are to succeed, will they also have to compete with websites? Despite the technology being in its early stages, there has been a huge win in the PWA world by the launch of Flipkart’s app. Flipkart, ‘India’s largest e-commerce site’ had been struggling to provide its customers with an experience which was ‘fast and engaging’ (Google, 2016). Having tried moving their customers from their mobile web offering to their apps by turning off their mobile site in order to offer a better service, they switched tactics in 2015 and began redeveloping their web offering to include the progressive web application shell which will be used as a case study for this paper. It is important to understand the position of PWAs in relation to native and if it can pose a threat to native. When considering Porter’s five competitive forces that shape strategy, PWAs follow the Substitute model which is defined as performing ‘the same or a similar function as an industry’s product by a different means’. As much as they utilise the same attributes as the native application, they sit on the mobile web giving it key competitor advantages. According to Bower & Christensen, disruptive technologies succeed when the ‘performance attributes that existing customers do value improve at such a rapid rate that the new technology can later invade those established markets’. Product – how much will the apps cost to build and maintain? The Native Product – native apps are notoriously expensive to create, teams of User Experience (UX) Designers, Application developers and Project managers are required to build each app for each store that it is placed. This customised experience isn’t necessary for all products, not all apps require access to a user’s camera or microphone, nor do they need to store complex data or pull in streams. If we take an example of a publishing website which is a low download item as its predominant pieces of downloadable content are images, text, website style sheets (CSS) and advertising, native apps require offer a lot more than developer needs. Native apps are like ordering a cheap take away and having it delivered in a Bentley. The information sizes and content pieces are small, but the wrapper it is delivered in is large, complex and excessive. This is further amplified by the fact marketers’ face developing multiple app formats to meet different consumer’s expectations. Table 1 shows the average costs for building native apps for Android and iOS vs a Hybrid app. The research, conducted in January 2015 by Comentum, estimates that development of native apps costing anywhere between $35,000USD and $70,000USD depending on size and complexity. The PWA Product – The Google report into Flipkart’s build does not confirm the development costs, but according to Amar Nagaram, Director – Engineering at Flipkart it was “done by five engineers in a matter of 42 days” . It is theoretical that the development costs were low especially as the costs would mainly be staffing. The value of the development would be highlighted by the fact that there would be no costs to upload to an app store and there would be no need to go through one of many laborious app reviews. These can take up to a month before an app is published cutting which would also dramatically improve roll-out times. When considering that getting a user to an app store is only half the battle, the choice and volume of competition is staggering highlighted by the 75 billion apps downloaded in 2015 alone. Shelf space is at a premium and the cost of acquisition is going up. According to the FIKSU Cost per Install Index (Figure 1) which ‘measures the cost per app install directly attributed to advertising’ the cost to get users to install applications on iOS is $1.78 and up to $2.51 on Android. These totals are an increase of 39% for iOS and a 66% for Android within the year within the space of a year. The data shows that marketers are going to need to increase their advertising budgets just to keep up with the rate of increase in cost to acquire users. PWA Promotion – Websites hold the greatest real estate in digital via the URL. Web addresses are easily accessible, sharable and are searchable by Google and Bing . Flipkart lite is easy to find, it is one url, however according to the Google report, since the ‘company implemented an “Add to Home Screen” prompt… ‘60% of all visits to Flipkart Lite come from people launching the site from the homescreen icon’ (Google, 2016) . Once installed, the website is able to provide users with push notifications just like native apps. Combined with the fact that users will not need to go through to an app store in order to download, the marketing campaigns can focus on directing the user direct to the site and to the app. The only limitation at present is that this tech is only available on an Android device using Chrome, Opera or Firefox. But the new real estate space for the homepage is crucial differentiator from websites. According to Gabor Cselle, “In a consumer mobile app, every step you make a user perform before they get value out of your app will cost you 20% of users” (Cselle, 2012) . He conducted this research through the launch of his DrawChart app when getting users through in-app sign up and register process. He found that the drop out along the funnel represents one of the biggest challenges for creating engagement (fig 2). Although 90% of users who visited the store page would download the app only 90% of those who downloaded the app would actually open it ‘I’m guessing that people are stockpiling apps for the impending apocalypse’ (Cselle, 2012). Alex Russell took this theory and worked out that if there were 1,000 keen users with 6 steps in the flow from getting to the app through to using it, we would be left with just 262 users by the end of the process. This represents a drop of 73.8% drop in users and considering the amount invested through advertising to bring in customers, it is not hard to see why apps are such a volatile marketplace. This theory can be verified by research conducted by FIKSU who in February 2016 reported that the cost for acquiring a loyal user through advertising stands at $3.50 on iOS devices. It is staggering that roughly 50% acquired users will not become loyal advocates of the app. This is highlighted by the fact that on average, users only access 25 apps per month. PWA Conversion rate – The conversion rate from download to usage will be theoretically higher for PWAs than Native apps, because the user has less steps to follow in the instal process. The user can visit the Flipkart website and add the site to their homepage with 2 clicks of a button for now. Being able to be 2 clicks away from installing will dramatically decrease dropout rate as users wishing to add the app will actively have conduct adding the app. Using Cselle’s 20% drop-off theory one can postulate that just 20% would drop off from installing the app to going to use in on their homepage. This data is somewhat validated by the fact that 60% of all visits to Flipkart Lite is via the homepage icon . What will further help conversion rates is the ability to browse a limited number of products offline thus extending the shopping experience. The app’s framework also has an additional benefit, its light weight framework means it is requires little data in order for it to work. This is shown by the fact that 69% of users were able to use the site fully even on a 2G network. From a consumer’s point of view importantly is that the Web App was required 3x less data to operate than the online version. In a market where consumer’s are understanding more of their data allowances, this has the ability to provide brand’s an USP and could even become a standard of best practice. Bruce Lawson of Opera believes that in addition to this consumers will also have “less to download; far fewer annoying app updates (because PWAs are always up-to-date)” (Lawson, 2016). The mobile web has been far behind the native app market for some time. According to Yahoo’s Flurry Report, “Apps continued to cement their lead, and commanded 86% of the average US mobile consumer’s time” . That means that just 14% of user’s time is on the mobile web. In Figure 3, Alex Russell uses comScore data to show the staggering interactivity levels native applications enjoy over mobile web. Despite more monthly unique visitors for mobile web than apps, the average number of minutes spent on app versus web is astounding with users on apps for 190.9 more minutes per visitor. 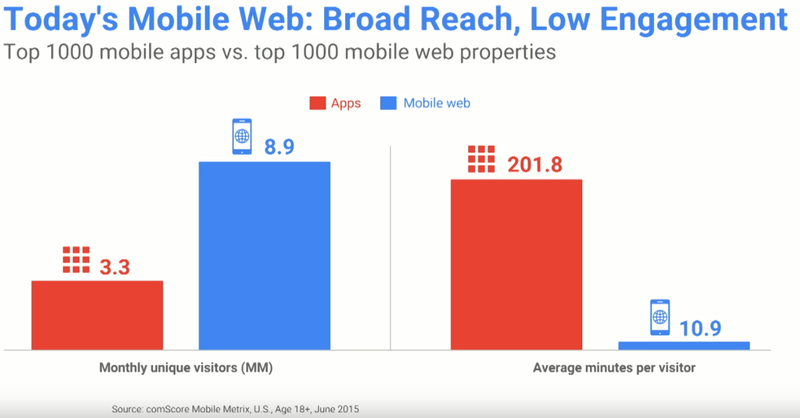 So it is clear that mobile web has the volume to compete, but not the engagement. That’s where Progressive Web Applications have the ability to reverse this trend. Flipkart has been able to show that this technology has the ability to increase conversion rates versus mobile web by 70% and increase engagement by over 40%. It has mainly been able to achieve this because it has found a way to crack through to the users homepage by being able to by-pass the app store gatekeepers. In doing so it is able to be part of the most prized real estate on the web whilst using its greatest asset… the URL. Promotional campaigns will become easier for marketers, they will not need to go to the drastic steps as shutting down their mobile offering like Flipkart had to, nor will it take a user 6 steps to use an application. Progressive web applications offer marketers the ability to cut through and offer an inclusive experience which offers the best of the web with the engagement of a native app. There are still limitations due to the fact that it is not fully available on all browsers but there is evidence that beyond Chrome, Opera & Firefox who offer this ability, Microsoft Edge will adopt the service workers and extensible web manifesto which are required for this technology. During an email interview this report conducted with Bruce Lawson, Deputy Chief Technology Officer at Opera which is a leading browser for progressive web application, it was clear that at some point native apps and will co-exist but “there will be fewer native apps as people see the potential in PWAs”. However will Apple’s reluctance to adopt fully to PWA strangle this burgeoning technology? No – but it might slow adoption in Western markets. PWAs are going great guns in places like India, Indonesia, Africa where Android devices far outnumber iThings. Note that Service Workers are “under consideration” in WebKit (the engine that powers Safari) and they’re mentioned in the WebKit 5 year plan “Becoming a more frequent request. We should do it”“ (Lawson, 2016). It is highly recommended that marketers look to incorporate this new emerging theme as part of their upcoming development campaigns as the decrease in development costs could have a great impact on campaign yields. Businesses who fail to offer consumers alternative ways to interact with their content may quickly feel left behind and dated. However, the threat of the substitute will be most felt amongst the companies who are heavily involved in the development of native apps. Considering the product development costs involved, it is highly likely that PWAs will offer clients a cost effective solution via web developers. Companies already have to have a web presence, but if their store front can be upgraded to incorporate the best of apps and online, the need to have a dedicated product will become decreased. This may not be the death of the native applications; it is certainly the rebirth of mobile web and a progressive shift forward for the consumer. Anne Salz, P. (2015) ‘Winning big with long-tail apps’, ECONTENTMAG.COM(September), p. 32. AppBrain (2016) Number of Android applications. Available at: http://www.appbrain.com/stats/number-of-android-apps (Accessed: 13 May 2016). Biharisingh, A. (2015) Are progressive web Apps the future of mobile Apps? Available at: http://gonehybrid.com/are-progressive-web-apps-the-future-of-mobile-apps/(Accessed: 9 May 2016). Bower, J.L. and Christensen, C.M. (1995) ‘Disruptive technologies: Catching the wave’, Harvard business review, 73(1), pp. 43–53. doi: 10.1016/0737-6782(96)81091-5. Columbus, L. (2013) IDC: 87% of connected devices sales by 2017 will be tablets and Smartphones. Available at: http://www.forbes.com/sites/louiscolumbus/2013/09/12/idc-87-of-connected-devices-by-2017-will-be-tablets-and-smartphones/#1a3521cf2472 (Accessed: 9 May 2016). Comentum Corp (2015) Native App development vs hybrid / PhoneGap App development. Available at: http://www.comentum.com/phonegap-vs-native-app-development.html (Accessed: 10 May 2016). comScore (2015) 2015 UK Digital Future in Focus. Available at: https://www.comscore.com/layout/set/popup/content/download/31495/1802925/version/1/file/2015-UK-Digital-Future-in-Focus.pdf (Accessed: 12 May 2016). comScore Inc (2015) Digital future in focus: Global. Available at: https://www.comscore.com/layout/set/popup/content/download/31739/1808335/version/1/file/Global+Future+in+Focus-EN.pdf (Accessed: 12 May 2016). Cselle, G. (2012) ‘Every Step Costs You 20% of Users’, Gabor Cselle – Tales of Creation, Available at: http://blog.gaborcselle.com/2012/10/every-step-costs-you-20-of-users.html (Accessed: 9 May 2016). Dogtiev, A. (2015) App usage statistics: 2015 roundup – App industry insights. Available at: http://www.businessofapps.com/app-usage-statistics-2015/ (Accessed: 13 May 2016). Extensibleweb (no date) The Extensible web manifesto. Available at: https://extensiblewebmanifesto.org/ (Accessed: 11 June 2016). Fiksu (2016) Fiksu indexes. Available at: https://www.fiksu.com/resources/fiksu-indexes (Accessed: 12 May 2016). Fiksu (2016) Fiksu indexes – February 2016. Available at: https://www.fiksu.com/resources/fiksu-indexes/2016/february (Accessed: 24 May 2016). France-Presse, A. (2016) Indian firm launches £5 smartphone, thought to be world’s cheapest. Available at: https://www.theguardian.com/technology/2016/feb/17/india-cheapest-smartphone-worlds-ringing-bells (Accessed: 17 May 2016). Google (2016) A fast and streamlined site. Available at: https://developers.google.com/web/showcase/2016/pdfs/flipkart.pdf (Accessed: 10 June 2016). Kapadia, D. (2016) Progressive web Apps – the new future of mobile Apps? – Ness software engineering services. Available at: http://www.ness-ses.com/progressive-web-apps-the-new-future-of-mobile-apps/ (Accessed: 11 June 2016). Khalaf, S. (2015) Apps solidify leadership Six years into the mobile revolution. Available at: http://flurrymobile.tumblr.com/post/115191864580/apps-solidify-leadership-six-years-into-the-mobile (Accessed: 11 June 2016). Korf, M. and Oksman, E. (2015) Native, HTML5, or hybrid: Understanding your mobile application development options – developer.Force.Com. Available at: https://developer.salesforce.com/page/Native,_HTML5,_or_Hybrid:_Understanding_Your_Mobile_Application_Development_Options (Accessed: 9 May 2016). Lee, G. and Raghu, T.S. (2014) ‘Determinants of mobile Apps’ success: Evidence from the App store market’, Journal of Management Information Systems, 31(2), pp. 133–170. doi: 10.2753/mis0742-1222310206. Liu, C.Z., Au, Y.A. and Choi, H.S. (2014) ‘Effects of Freemium strategy in the mobile App market: An empirical study of Google play’, Journal of Management Information Systems, 31(3), pp. 326–354. doi: 10.1080/07421222.2014.995564. Marcotte, E. (2010) Responsive Web Design. Available at: http://alistapart.com/article/responsive-web-design (Accessed: 9 May 2016). Mendis, R. (2015) The native mobile App: ‘Reports of my death have been greatly exaggerated’. Available at: http://www.anypresence.com/blog/2015/01/07/native-mobile-app-reports-death-greatly-exaggerated/ (Accessed: 9 May 2016). Moore, C. and 007, davebloggs (2016) Why the chat App will kill the Internet Browser. Available at: http://www.cmswire.com/customer-experience/why-the-chat-app-will-kill-the-internet-browser/ (Accessed: 9 June 2016). North, D. (2015) It costs more than $3 to acquire a mobile user now, Fiksu finds. Available at: http://venturebeat.com/2015/04/30/it-costs-more-than-3-to-acquire-a-mobile-user-now-fiksu-finds/ (Accessed: 12 May 2016). Porter, M.E. (2008) ‘The Five Competitive Forces That Shape Strategy’, Harvard Business Review, 86(1), pp. 78–93. Ranger, S. (2015) IOS versus Android. Apple App store versus Google play: Here comes the next battle in the app wars. Available at: http://www.zdnet.com/article/ios-versus-android-apple-app-store-versus-google-play-here-comes-the-next-battle-in-the-app-wars/ (Accessed: 13 May 2016). Russell, A. (2015) Progressive web Apps: Escaping tabs without losing our soul. Available at: //medium.com/@slightlylate/progressive-apps-escaping-tabs-without-losing-our-soul-3b93a8561955#.9ai4gtlsj" rel="nofollow" style="box-sizing: inherit; font-family: inherit; font-size: 18px; font-weight: inherit; font-style: inherit; margin: 0px; padding: 0px; vertical-align: baseline; border: 0px; outline: 0px; color: rgb(7, 122, 124); text-decoration: none;">https://medium.com/@slightlylate/progressive-apps-escaping-tabs-without-losing-our-soul-3b93a8561955#.9ai4gtlsj (Accessed: 9 May 2016). SFHTML5 (2016) Progressive web Apps with Alex Russell. Available at: https://www.youtube.com/watch?v=x7cfLDFVyHo (Accessed: 9 May 2016). Sharma, S. (2015) Five engineers, 42 days: How Flipkart built an ‘App’ for the mobile web. Available at: http://gadgets.ndtv.com/internet/features/five-engineers-42-days-how-flipkart-built-an-app-for-the-mobile-web-763729 (Accessed: 11 June 2016). Siegler, M. (2010) Sergey Brin: Native Apps and web Apps will converge in the not-too-distant future. Available at: http://techcrunch.com/2010/05/19/chrome-os-versus-android/ (Accessed: 12 May 2016). Statista (2016) Number of apps available in leading app stores as of July 2015. Available at: http://www.statista.com/statistics/276623/number-of-apps-available-in-leading-app-stores/ (Accessed: 13 May 2016). Stolyar, A. (2016) Progressive web Apps isn’t a Google-only thing. Available at: //medium.com/@nekrtemplar/progressive-web-apps-aint-google-s-thing-31ca581e7a1#.br0kzcq39" rel="nofollow" style="box-sizing: inherit; font-family: inherit; font-size: 18px; font-weight: inherit; font-style: inherit; margin: 0px; padding: 0px; vertical-align: baseline; border: 0px; outline: 0px; color: rgb(7, 122, 124); text-decoration: none;">https://medium.com/@nekrtemplar/progressive-web-apps-aint-google-s-thing-31ca581e7a1#.br0kzcq39 (Accessed: 15 June 2016).